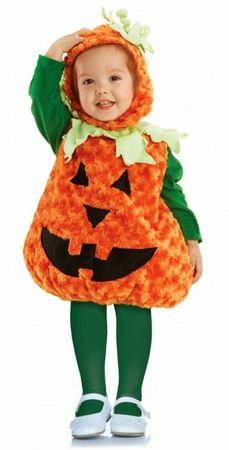 Available Sizes/Colors: Size "M (18-24 months)"
Dress up your little one as a cuddly pumpkin in this toddler/child size costume. Includes orange plush swirl faux fur "Belly Babies" tunic with black jack-o-lantern face and orange hood with soft green leaves. Tights, shirt and shoes not included. By Underwraps. Check out more options in our Toddler Costumes section!